Wrap the tofu in paper towels and very gently press out some of the excess water. In a medium bowl, using a fork, smash the tofu into small crumbles. In a small bowl, whisk 2 tablespoons of the olive oil with the vinegar, turmeric, crushed red pepper and 1/3 cup of water. 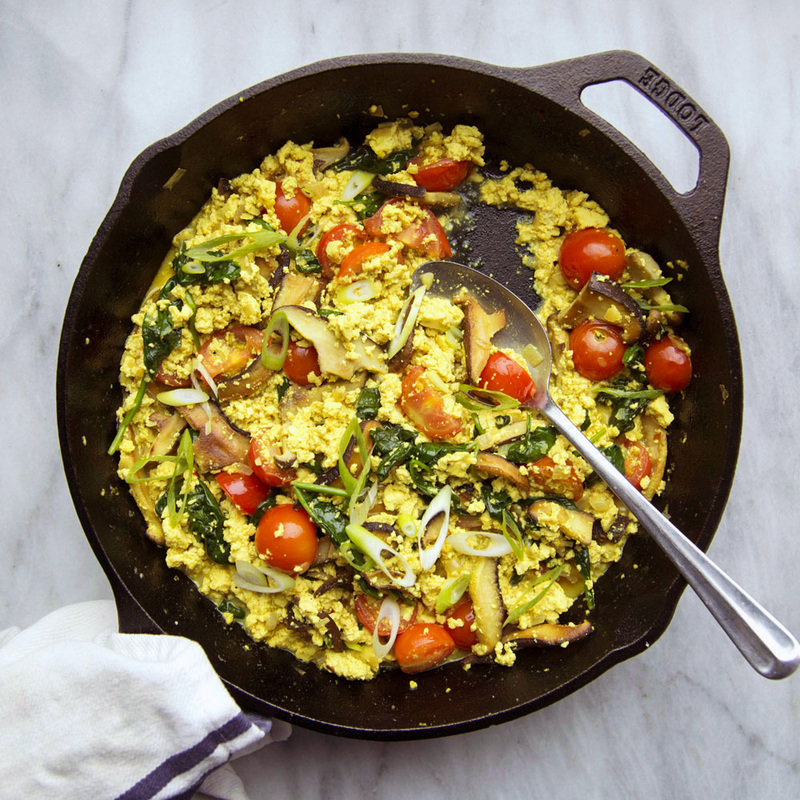 In a large cast-iron skillet, heat the remaining 2 tablespoons of olive oil. Add the mushrooms and a generous pinch of salt. Cook over moderate heat, stirring occasionally, until browned and just tender, about 6 minutes. Stir in the shallot and garlic and cook until the shallot is softened, about 2 minutes. Add the tofu to the skillet and season with salt and pepper. Cook over moderate heat, stirring occasionally, until heated through, 2 to 3 minutes. Stir in the turmeric sauce until the tofu is coated and bring to a simmer. Stir in the spinach and tomatoes and cook until the spinach is just wilted and the tofu is coated in a light sauce, about 2 minutes. Season generously with salt and pepper. Garnish with scallions and serve immediately.